Plantar Fasciitis is a common foot condition that is responsible for causing pain on the bottom of the foot (typically around the heel). Runners and other athletes are especially at risk for developing the condition because of the amount of pressure placed on the feet. The plantar fascia is a ligament that runs from the heel to the front of the foot – providing support to the arch of the feet. Pain occurs when this ligament becomes stressed and inflamed. At Orthopaedic Associates of St. Augustine, our Foot and Ankle Center has several experts that can diagnose plantar fasciitis and recommend treatment so you can be on your way towards recovery. Plantar fasciitis is a chronic condition that can easily become long-lasting if rest and proper treatment isn’t implemented. 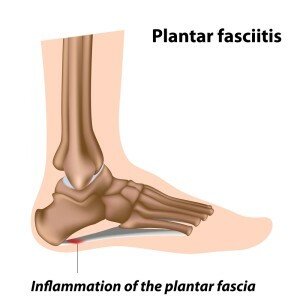 Plantar fasciitis symptoms primarily consist of pain on the bottom of the foot near the heel. Pain is most severe when walking after long periods of rest. Getting out of bed in the morning or stepping out of a car are often examples that patients give when describing symptoms. Pain is also common after increased activity. Although plantar fasciitis is often diagnosed among professional athletes or active runners, the condition can arise in patients that are less active. Plantar fasciitis typically does not require imaging scans for an accurate diagnosis, but X-rays may be ordered to rule out other conditions like fractures, arthritis and heel spurs. Rest is the highest priority when treating plantar fasciitis. Any activity that may have caused the condition should be stopped immediately. Movement that causes pain should be avoided as well. Icing the heel, providing arch support, and performing specific stretches will generally relieve symptoms but it should be known that some cases are more persistent than others. It is possible for cases to last longer than 6 months. Early treatment is important to alleviating symptoms and returning to normal activities. Our physical therapists can demonstrate the exercises you’ll need to do in order to recover in a timely fashion. If you feel symptoms around your heel and fear it may be plantar fasciitis, schedule an appointment to visit our Foot and Ankle Center. Our specialists will answer your questions and help you get back to doing the things you love pain free.